Centerville is an affluent suburb situated in Montgomery and Greene Counties of Ohio. 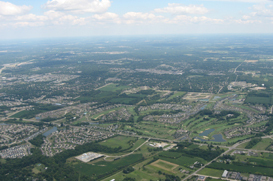 A part of the Dayton metropolitan area, its population was 23,999 as of the 2010 census. Centerville boasts the largest collection of early stone houses in the state of Ohio. Of which many are listed in the National Register of Historic Places. Centerville’s education system is decorated with a collection of Blue Ribbon Schools. It’s educational make up includes one High School and one Alternative High School plus 6 elementary schools, 3 middle schools and 2 kindergartens through first grade schools and one pre-school. The median income for a household in the city is roughly $54,892, and the median income for a family is roughly $68,580. The per capita income for the city was $30,210. The Heart of Centerville features a selection of boutiques, restaurants and businesses in a historic setting and it’s own Town Hall Theatre serving the community for over 70 years.